The government of President Rafael Correa achieved what seemed impossible since the late 1990s: it reunited Ecuador’s Indigenous movements. Yet, this was not likely the intended goal of evicting the Confederation of Indigenous Nationalities of Ecuador (CONAIE) from its headquarters. The government of President Rafael Correa achieved what seemed impossible since the late 1990s: it reunited Ecuador’s Indigenous movements. Yet, this was not likely the intended goal of evicting the Confederation of Indigenous Nationalities of Ecuador (CONAIE) from its headquarters. In his weekly broadcast (sabatina no. 403), President Correa argued that CONAIE (mis)used the premises for political activity, adding that the organization failed to represent its Indigenous bases. The Indigenous movement, which had been split in pro-and anti-Correa factions, immediately united in one voice to defend its umbrella organization. Whoever was in political limbo now knows where to stand, and it is not with the government. President Correa provided the common threat to cement a broad Indigenous coalition. It seems ludicrous to accuse the Indigenous movement of doing politics. As Ecuadorean journalist Roberto Aguilar pointed out, it is the Indigenous movement that permitted one of Ecuador’s greatest political transformations. The CONAIE was given this building back in 1991, a year after the massive uprising that blocked the country and forced the government to take Indigenous politics into account. The Indigenous movement became a central political actor in national politics, and the CONAIE has been based in this building for nearly a quarter of a century because Indigenous politics need a base in the capital. At the time, the government of President Rodrigo Borja agreed to let the CONAIE use the building until 2021, and despite pressure from conservative governments, the deal has been respected until now. It is ironic that the CONAIE has to defend its right to exist as a political movement from a left-wing government that self-identifies with social justice. Yet it is not surprising. Correa’s government has repeatedly criminalized Indigenous demands, most notably claims to water rights. It has also launched the Decree 016, which makes it illegal for social organizations to engage in politics. The President’s accusation that the CONAIE has used the building for political purpose refers directly to the prohibition Decree 016 imposed. The CONAIE’s house has come to symbolize the memory of Indigenous struggles against neoliberal agendas, for self-determination, and for more participatory forms of democracy. Eviction was intended to silence Indigenous contestation. 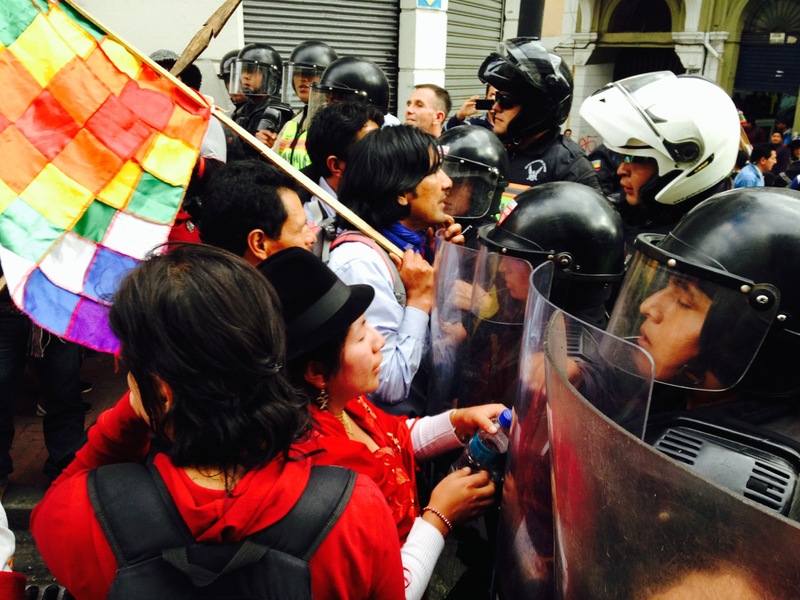 Indigenous organizations from around Ecuador responded to the eviction by mobilizing in Quito. On Jan. 5 and 6, thousands of people gathered in a festive occupation of the CONAIE’s house. People came from all venues. The three organizations that constitute the CONAIE were present: the Confederation of Indigenous Nationalities of the Ecuadorian Amazon (CONFENIAE), the Confederation of Peoples of Kichwa Nationality (ECUARUNARI), and the Coordination of Indigenous and Black Organizations of the Ecuadorian Coast (CONAICE). Each organization was accompanied with smaller local organizations, like the Federation of Peasant Organizations of Azuay (FOA). People mobilized from the southern provinces of Zamora to the northern coast of Esmeraldas. The event was a display of political unity. Past leaders participated in the meetings, including Humberto Cholango, Blanca Chancoso and Delfin Tenesaca. The event counted historical icons of the Indigenous movement, like the former Minister of Foreign Affairs and Supreme Court Judge Nina Pacari. All elected Pachakutik politicians were present, from Congress members like Lourdes Tibán and Pepe Acacho, to the three governors in office, Salvador Quishpe (Zamora-Chinchipe), Jorge Guaman (Cotopaxi), and Marcelino Chumpi (Morona Santiago). The defense of the CONAIE’s house also included non-Indigenous personalities. Various artists showed up to light up the celebration. In the evening, Ecuadorean comedian Carlos Michelena brought widespread laughter with a satire of past presidents. Singers Jaime Guevara and Rosa Lanchima kept the crowds dancing late into the night before everyone camped overnight in the building. Filmmaker Pocho Alvarez covered the marches. There were leading environmental activists from Acción Ecológica and Yasunidos; feminists like Rocio Rocero. Intellectuals joined as well, including Ileana Almeida, Alberto Acosta, Enrique Ayala, and Alejandro Moreano. Francois Houtart (Belgium) and Pietro Ameglio (Mexico) echoed support from abroad. Many more sent their international support in the form of open letters to President Correa. Boaventura de Sousa Santos’ personal letter to President Correa defined the expulsion of the CONAIE as an “unjust and politically senseless act,” provoking powerful repercussions that encouraged many more letters. Bolivia’s National Council of Aullys and Markas of the Qullasuyo (CONAMAQ) condemned the eviction as “racist and discriminatory,” and Correa’s administration as “anti-Indigenous.” Over 400 international intellectuals signed a letter denouncing the eviction as an “act of retaliation that disrespects the memory and history of an organization to which Ecuador owes extraordinarily deep and positive democratic struggles and social transformation.” This included European leftist intellectuals like Marxist philosopher Antonio Negri and Latin American icons like Leonardo Boff. After two days of political debate, ancestral ceremonies, singing and dancing, the CONAIE’s extraordinary assembly came up with a set of resolutions. The CONAIE declared to keep a permanent extraordinary assembly until the conflict against Indigenous people receives a permanent solution. In the meantime, it vowed to defend the house through a permanent vigil. 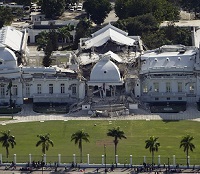 The Indigenous movement demanded that they be given a title for the building in its own name instead of borrowing the location from the government. It asked that the CONAIE’s house be declared part of the historical heritage and an Indigenous territory as reparation for centuries of oppression. This would mark a starting point for the devolution of ancestral territories that need to be returned to Indigenous peoples. The Indigenous movement declared independence from Decree 016, which requires social organizations to register with the state in order to be legal. Indigenous organizations not only reiterated their refusal to comply with the decree, but the CONAIE also promised to strengthen its organizational structure and political coordination. For instance, CONAIE called for a Peoples National Summit on March 5-6, 2015, to build a collective agenda with various social sectors, including labor unions. The ?ECUARUNARI went further declaring civil disobedience to Decree 016. About 20 Indigenous communities have already followed the initiative, registering with the ECUARUNARI instead of the government. There may be thousands of Indigenous organizations in Ecuador, but none has yet registered with the government as required by Decree 016. Lastly, the CONAIE’s resolution delegated a chasqui (the Inca messenger who ran across the Empire) to take the set of resolutions to the Carondelet palace accompanied by the Peoples. After some closing speeches, a peaceful march set off to the Presidential Palace in downtown Quito. The various delegations marched for about three hours, chanting slogans as they closed down traffic in one of the capital’s main avenues. The chasqui would not have been able to deliver the CONAIE’s resolutions to President Correa, who was on a trip to China. But it was impossible to reach Carondelet in the first place. As in almost every popular march over the last year, Ecuadorean police blocked access to a four block perimeter around the president’s office. The march was able to pass a first police blockade six blocks away from Carondelet. There was resistance from the police, who beat some protesters and pepper sprayed others. I was pepper sprayed at very close range by a police officer as a form of retaliation for taking pictures of their violence against a young Saraguro activist. The protest ended at the San Francisco Square with a couple of speeches and more music. As of now, the minister in charge of evicting CONAIE allowed the movement to remain in the house for another two months to process legal requests. It remains to be seen whether the government of President Correa will retreat or move forward with the eviction despite the possibility of a strong confrontation. 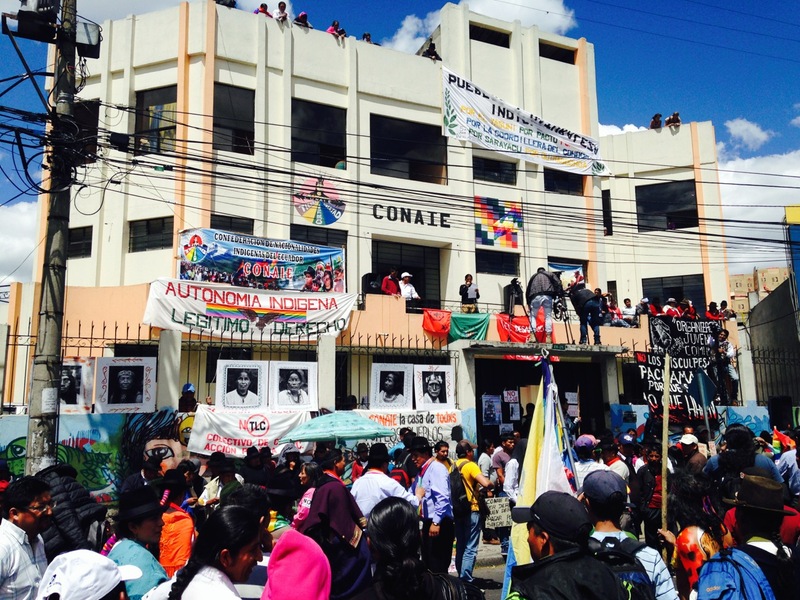 The eviction of the CONAIE from its historical headquarters mobilized support across social sectors in Ecuador and abroad. 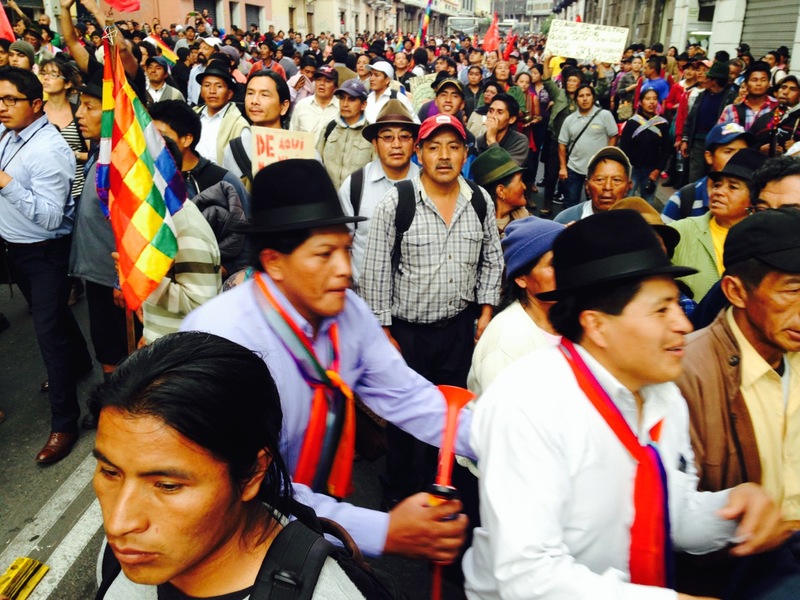 This widespread support indicates that the CONAIE remains a powerful symbol of Indigenous struggles worldwide. The house represents the political memory of one of the most important social movements in contemporary Latin America. One of the slogans during the march said, “They will not force us out of the house, they will not take our memory away.” The CONAIE’s house is what Pierre Nora has called a site of memory of the Indigenous movement in the region. 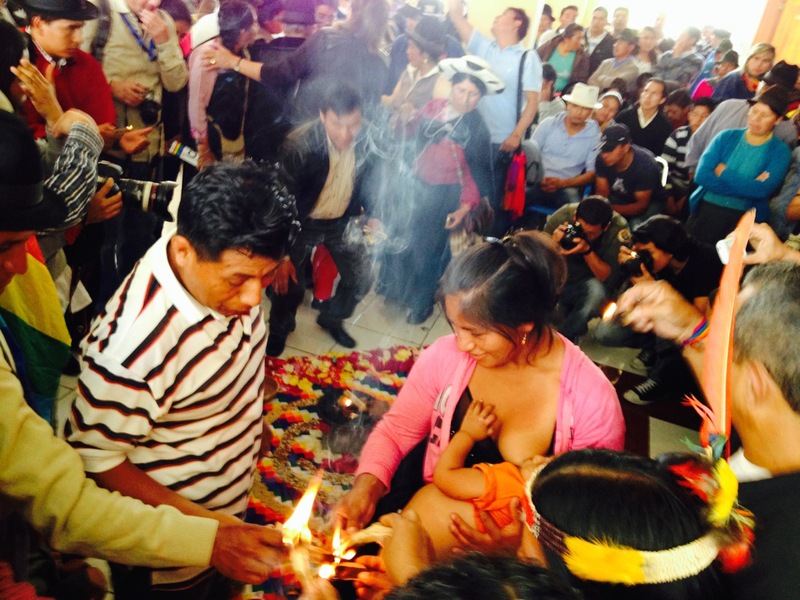 Yet Guartambel, president of the ECUARUNARI, recalled that Indigenous contestation takes place in the streets. For him, the CONAIE defends this historical space of political leadership for its role in changing the country – changes that largely benefited President Correa, he recalls. The eviction has generated so much upheaval, not so much because of the walls, but because it epitomizes something much larger. The Indigenous coalition united in defense of the CONAIE’s house. Yet the stakes go well beyond the building. Indigenous groups have been contesting the government’s undermining of plurinational education, in particular the recent closing of bilingual schools and of the Indigenous university Amauta Wasi in 2013. It has denounced the dismantlement of the National Council of Peoples and Nationalities (CODENPE), which is now under the Ministry for Political Management. It has debated the restriction of Indigenous rights to self-determination with the limitations recently imposed on the exercise of Indigenous justice. Most importantly, Indigenous groups are demanding the exercise of their rights to self-determination to refute extractive industries that displace and appropriate Indigenous territories and resources. This mobilization around the CONAIE’s eviction echoes past struggles. Since 2008, the government of President Correa has increasingly criminalized social protest. The harassment has turned into a systematic lawfare that has criminalized about 200 activists, including Indigenous leaders like Pepe Acacho and Guartambel for claiming water rights. The government is not only trying to break individuals, but Indigenous political platforms as well. In addition to the CONAIE’s house, the government is harassing the movement’s electoral branch, the Indigenous party Pachakutik. According to its Coordinator Fanny Campos, the government has illegally cut governmental funds assigned by law to the party, forcing Pachakutik to start a lengthy legal process that has been stuck in the country’s Constitutional Court for months. Yet this mobilization is inevitably embedded in the negotiations of future agendas. The mobilization frequently invoked the recent free trade agreement between Ecuador and the European Union, which the government has yet to make public. Another point of concern is a new law on the use of land with high stakes for Indigenous and peasant communities. The ECUARUNARI’s leadership took the mobilization for CONAIE’s house as the opportunity to elaborate various demands regarding the new law on land to be discussed in Congress this month. These encompassed specific requests ranging from the redistribution of land, the exoneration of building taxes for small peasants, freedom to parcel land, and collective rights to self-determination over ancestral territories. The mobilizations for CONAIE’s house may signal a turning point that merits attention beyond Indigenous politics.